long and was located on a farm property. levels of terrain, one where the staging area is located, and a lower level below a ridge that cuts through the property. On either of these levels, most of the terrain would be flat, if not for the parallel strips of dirt left by mining equipment. for challenging conditions. Overall, it's a fun place to ride. cleaning the clay off your bike. course, and it is a fast one with sweeping turns and relatively easy jumps. This is a fun, challenging place to race. here, as District 17 schedules a handful of hare scrambles at this location each year. Just outside Moline is a small tract of land used in the WFO series of hare scrambles (also part of the D-17 schedule). somewhat loamy, but if damp, expect to see lots of it clinging to your bike after the race. Little Egypt club in past years. District 17 has also included this in its enduro series as a closed-course event. the tight trails made for some challenging passes. much that a soft terrain tire isn't really necessary. However, I learned in 1999 that it's better to be safe than sorry. racing difficult. Certain sections of the course are very tight, so speeds are generally moderate. and bad conditions here, and the good is very good; the bad can be pretty challenging. usually set up for 3-5 miles loops. 2006. The terrain is much like most you'll find in North-Central Illinois, with smooth dirt (or mud) and almost no rocks. the enduro was at the old high school in Leaf River, which now serves as a community center. through the 7-mile section on the property where hare scrambles are held (I had already houred out at that point). wait until the area has been dry for a week. Until the Last Man Standing came along, the Moose Run was universally recognized as the toughest race in the U.S.
very much at home here, and as such, when dusty it's downright dangerous. I happened to ride the hare scramble here in 2006 in very wet conditions. Even so, the course held up fairly well. the ground, and going under it was about as difficult as it would have been riding over it. 1996. 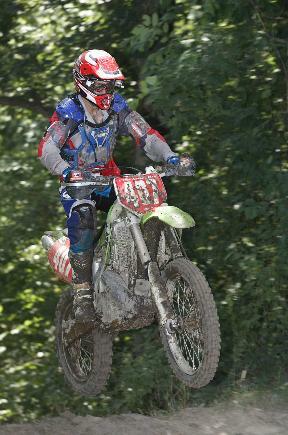 Over the past few years, hare scrambles are mostly limited to an annual charity event in November. nice waterfall was in that same area). scramble. Sandy soil holds up to moisture very well, and it's actually more fun to ride here when the ground is wet. motocross track near the staging area and plenty of sand. is heavy with clay and gets slick when wet. When dry, the surface gets pretty hard-packed. the early 2000's. In fact, for a variety or reasons, I've only finished the enduro one time.